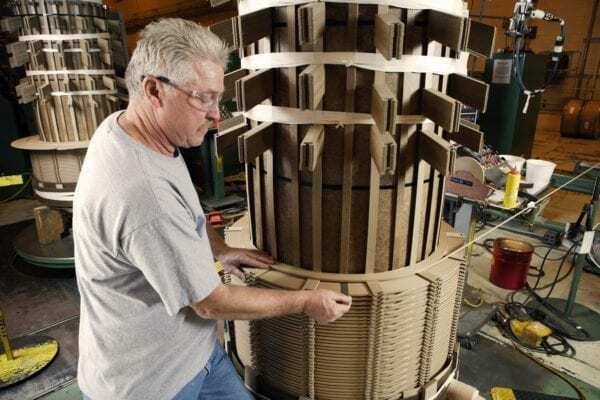 Core & Coil Manufacturing | SPX Transformer Solutions, Inc.
Every Waukesha® transformer features core form construction. Both our medium and large power transformers are built with copper windings in a circular configuration and are continuous disc and/or helical in design. This helps to ensure quality and reliability throughout the internal structure of the transformer. Copper and silver alloyed copper magnet wire—or continuously transposed copper cable—is used for the winding conductors on all Waukesha® power transformers. Continuously transposed copper cable is used to minimize losses and hot-spot temperatures and to produce a more compact winding with improved short-circuit performance. All windings are circular, concentric type and provide maximum through-fault withstand capability. High voltage and low voltage windings use a continuous-disc or helical winding design. This construction provides maximum strength and short-circuit withstand capability, increased predictability and lower hot-spot temperatures for loading and overloading. Multiple conductor continuous disc and helical windings are transposed throughout the winding to minimize circulating current losses. State-of-the-art design techniques are used to provide maximum impulse strength in the windings and to minimize voltage stresses. Special design consideration is also given to the line end discs to control voltage stress distribution. Ampere-Turn balancing techniques are used to minimize radial leakage flux and to minimize axial short-circuit forces. In order to ensure short circuit performance, windings are manufactured to meet stringent design tolerances for coil winding electrical height, tap locations and spread section locations. Cooling ducts are formed between discs in the continuous-disc and helical windings by keyed radial spacers made of special high-density pressboard insulation. These spacers are aligned in column to provide axial support for the windings and high short-circuit strength. All windings are manufactured in a clean winding environment. This isolated “factory within a factory” is humidity and temperature controlled 24 hours a day with controlled access to minimize contamination. All Waukesha® transformers employ core form construction. Cores are manufactured from high permeability-grade, domain-refined “H” grade, cold-rolled grain-oriented silicon steel (“M” grade steel is used in some applications). Annealing all core steel after slitting provides optimal loss performance. Core designs utilize a multiple step circular cross section with fully mitered joints. 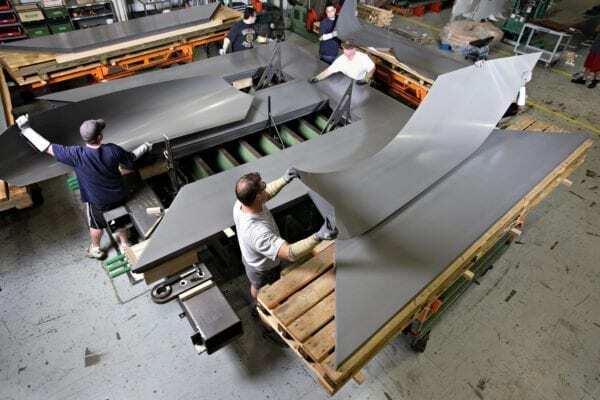 Laminations cut to length on special high-speed, computer-controlled, automatic shears to high dimensional accuracy ensure tight-fitting joints with minimal gaps to minimize core loss, exciting current and sound levels. Insulating the core from the frame and connecting to ground at only one point prevents any accumulation of static charges. Grounding at a single point also eliminates circulating currents and associated combustible gas generation. The grounding strap is brought out to a convenient location adjacent to an access hole opening on the cover or through a bushing on the tank cover to facilitate testing the core insulation. After stacking, a two-part epoxy is applied to bind the core legs together, then banding is installed to form a rigid structure. Sturdy steel end frames provide a complete core structure of high mechanical strength to withstand heavy stresses during shipment or under short-circuit conditions without distortion of the core or windings. After the cores are banded together and uprighted and the coils have been wound, processed, pressed and sized, its time to put them together in a process called “landing the coils.” Each limb, or leg, of the core will have 2 to 5 windings landed on it after which the entire core and coil assembly goes through a thorough cleaning and careful inspection process before proceeding to a pressing operation that aids the final assembly of the core. Once the assembly is under pressure, it is cleaned and inspected again and then put through a process called top yoking, where top yoke steel is assembled to the limbs within very close tolerances to ensure no core loss issues on the test floor. Upon completing the top yoking, the unit is “pulled in.” This “pulling in” procedure includes tightening the core clamps onto the steel, tightening up the yoke bands and adding all the extra insulation required in the design. Precise, pre-calculated methods of clamping the core and coil assembly together assure a positive clamping pressure on the coils at every point and provide maximum through-fault protection no matter how dry the transformer may become while in service. Pre-assembled cleat and lead structures (wood frames with the insulated cable and, oftentimes, a de-energized tap changer assembled to them) are now attached to the assembly. 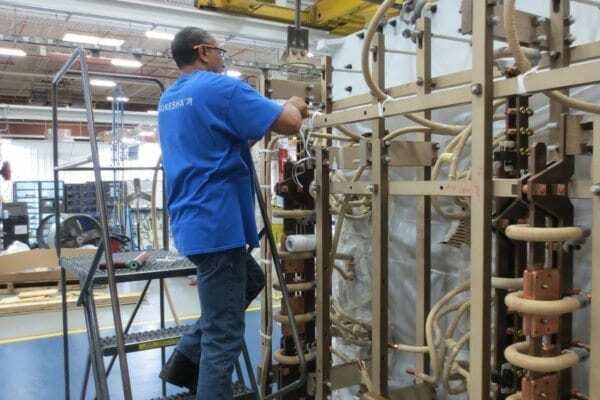 All connections are crimped and wrapped according to engineering specifications, with each crimp signed by the operator for quality auditing purposes; special care is taken when wrapping crimps to minimize dielectric stresses. Once all connections are made, the assembly is ratioed and tested again, inspected and then released to Vapor Phase. © 1996 - 2019 SPX Transformer Solutions Inc.